Take a 1992 TJB Homes, Inc. custom built three level split home and update the kitchen from boring old dark Oak woodwork & cabinets, to create a space with a useable peninsula for sitting for 5 and a work space that allows more then one person in the kitchen at a time. Complete kitchen demo/ remodel, relocate fridge to allow a functional work flow, all new custom Maple cabinets maximizing all useable space, Granite tops w/ ceramic backsplashes to create timeless design, shorten wall to open space @ existing living room, reverse side of peninsula to allow sitting for 5 without disrupting dinette. 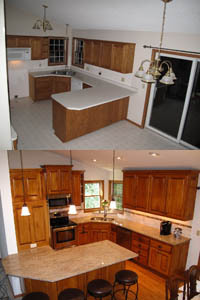 The before & after’s speak for themselves, a custom designed kitchen where the new grandchildren can hang out or even help Grandma & Grandpa prepare meals & snacks together. An updated kitchen with a timeless design.